Roger Corman, the king of the B movies, made a silly little black and white film in 1960 for $27,000. One of the bit players was a new kid in town named Jack Nicholson, and the movie has long had a cult status, beloved by those who are into strange little films. It was remade in 1986 with a much larger budget (and color film), then it became a musical. Last night, Gail and I joined Mike and Linda Bandler to see the Conta Costa Musical Theater performance at the Lesher Center. Nicole Helfer stars with her bloodthirsty friend. The story is about a loser, Seymour, who works in the Skid Row Flower shop. He finds a strange plant which makes the shop successful and him important, but the plant needs blood to survive. Seymour has a crush on Audrey, who works with him, but she has a strange, sadistic boyfriend who is a dentist. Seymour feeds the dentist to the plant, solving two of his problems at once. Then the story gets strange. The movie has a happy ending, the play doesn’t. Contra Costa Musical Theater is a semi-professional company–most of the players are very talented locals. There are two Equity actors in the cast–Robert Brewer as Seymour, and Kelly Houston who is the voice of Audrey II, the animated plant. Nicole Helfer, as Audrey, is a local dance and vocal teacher, and stunning in her ability. She has the two best songs in the entire show, Somewhere That’s Green and Suddenly, Seymour. There aren’t any weak spots in the cast, just very good and even better. 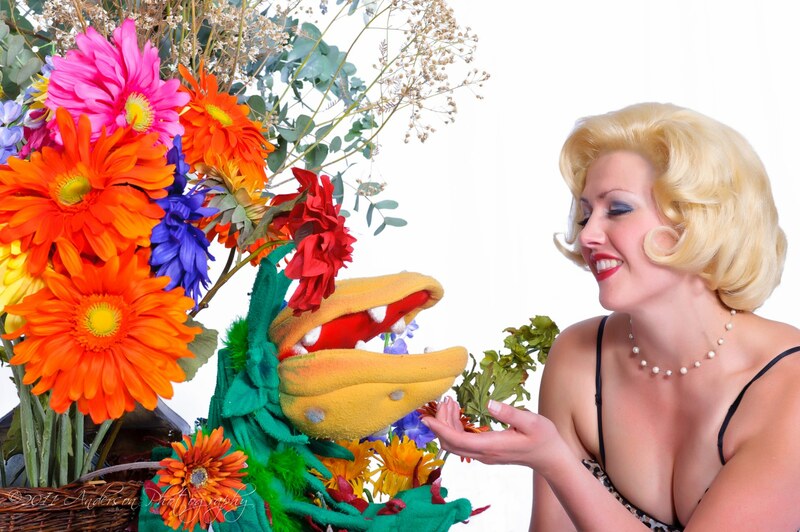 The sets are tremendous, and the plant, Audrey II, is portrayed by a Jim Henson created puppet, operated by Jason Pedroza. Costuming Carol Edlinger is excellent–Gail was impressed by the effort involved for even a short scene. I’ve got nothing but good things to say about this performance–it will be there until November 13. The audience was full of young ones—maybe you want to take your grand-kids, it’s a great way to get them familiar with the theater.